Write Up: I put this project together in a week for my final undergraduate studio. This project was paired with another transportation terminal project later for the same studio. The goal focused on how transportation systems could be designed differently and break away from typical solutions that hinder the mass transportation systems. The bus stops would be located along a new proposed corridor of Fremont Street (see red circles on the map). Part of the design was to realign all mass transportation systems along Fremont Street to the center of the street, allowing the buses to have their own dedicated lanes and central boarding stops for riders. In Addition to realigning existing systems this design would allow for the new ACE system being implemented in the region as well as allow expansion into a light rail system if one were to be implemented in the future. The design addresses two primary issues of current bench systems. One is the universal discomfort of sitting close to a stranger, unless no other opportunity is present, by separating the universal bench model into singular seats. Individuals would feel more comfortable to sit waiting for the bus and the design would prevent issue like the homeless utilizing the stop for long term stays. The second issue is more common to the Las Vegas area where shade is needed in the summer months. 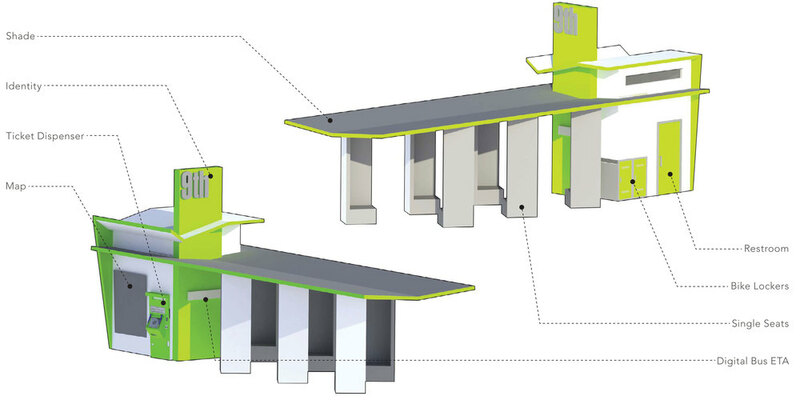 By having the seats vertically continue to the roof system one could sit in the shade. 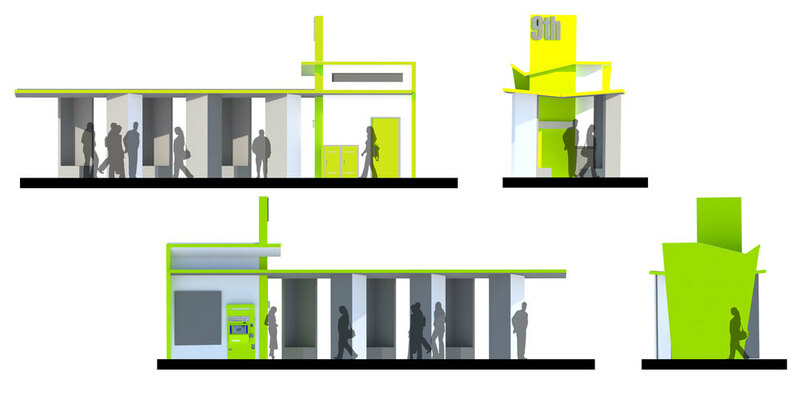 Other elements of the design include a new digital ticketing system where one can purchase a ticket, view maps and look up real time information from a kiosk, a digital ETA board, Bike Lockers, and a restroom. The restroom would be the self-cleaning type and help serve the future needs of the street's future nightlife.